James First Affair, under jockey Eddie Aceves, setting the fastest time in the Adequan Les Bois Derby Challenge on Wednesday. BOISE, ID�JULY 15, 2015�Multiple stakes sire IVORY JAMES sired three finalist to the $22,500 Adequan Les Bois Derby Challenge from three trials contested on Wednesday night. Originally set for July 10, the trials races were rescheduled for tonight (July 15) due to extreme weather conditions in the Pacific Northwest last week. Ridden by jockey Eddie Aceves, James First Affair defeated Bh Lisas Boy by three-quarters in the second trial to set the top qualifying mark of :19.753 seconds, a 93 speed index with an 8 mph tailwind. James Hanson conditions the stakes winning son of IVORY JAMES for owners Robin Dunn, Larry Chapple and RTM Stables, LLC. James First Affair entered the trails off an impressive win in the $41,787 Bitterroot Derby at Les Bois Park on June 20. Bred by Tom Bradbury and Kim Kessinger, the brown colt has compiled a (12) 6-2-0 record while earning nearly $70,000. He is out of the First Down Dash mare First Fancy Affair. Hanson also saddled the winner of the first trial, Steinway Ivory who recorded the third fastest time of :19.812 seconds. Nakia Ramirez had the riding assignment for owners Rob Evans and Hanson Racing, LLC. 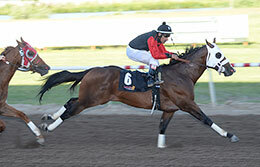 Blaine Bateman bred the son of IVORY JAMES in Utah from the First Down Dash mare Christie Jo Dash. The graded stakes-placed winner of five races has earned $42,220. Bryon Goody's homebred Getoutofthefastlane secured the final qualifying spot with a time of :19.987. Michael Monson saddled the son of IVORY JAMES to a third place finish to fastest qualifier James First Affair. Jose Figueroa had the riding call aboard the gelding out of Cruel Summer, by Streakin La Jolla. For a complete list of finalists to the Saturday, July 25th 400 yard final, including times, sires, dams, owners, breeders, trainers and jockeys CLICK HERE.